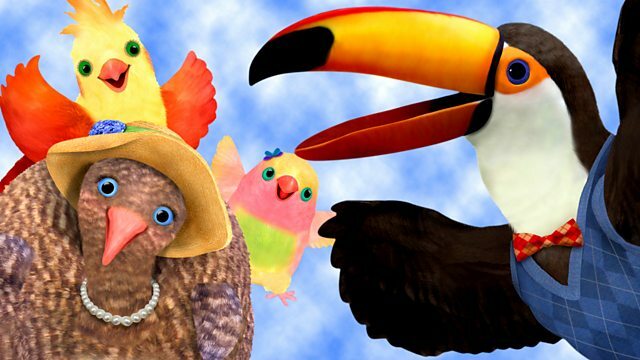 Colourful adventures of a group of birds who teach social responsibility. Samuel and Rudy are playing, but they can't agree on what to do. Browse content similar to To Play or Not to Play!. Check below for episodes and series from the same categories and more! To play, or not to play. and I'm ready to play with my bestest birdy friend. Samuel, you're the best, and the cleanest. # Rudy, I'm so glad you came! -But oh so dull, I much prefer to fly! # Rudy, can't we sit and chat? # Sammy, what's the fun in that? # Let's try something wild, fresh and new! Samuel, I don't want to do any of those things. Can we do something a little more...exciting? OK, Rudy, what do you want to do? Let's go to my branch. You're gonna love it. Ta-da! Take a look, Samuel! I know! Let's tidy things up! Well, what kind of game would you like to play? # Just what did you have in mind? # But there's no time for napping, Sammy, get those wings a-flapping! -# Rudy, can't we take it slow? Rudy, I have to be honest with you. -I think I like my games better. Can we go back to my branch? What's wrong with MY games and MY branch? Rudy, your games are great, they're just a little too...silly. Silly? Well, your games aren't silly enough. That's it, I'm going home. Samuel, Rudy, what in the world is going on? -He won't play what I want to play. -She won't play what I want to play. You two are best friends. We've tried everything, Mr Beakman. But you can't give up. There must be something you both like. - BOTH: Really? - Yes! There's always a way to play. # Well, you could throw a fit! - BOTH: Huh? - Come with me! Look, Rudy, I'm a bit of wood. ALL: # There's always a way to play. # Yes! that's boring enough for Samuel but exciting enough for me. Sorry! I really want to play with you. Well, I really want to play with you, too. -Sam'l, 'Udy! Come with Muffin. Mm, you know, I think little Muffin may be onto something. Ooh-la-la! More birds for dress up! -Oui! I dress up all ze little birdies! I like dress up. Do you, Rudy? Eureka! Dress up is something we BOTH like to do! # To ze branches of zis tree! # I'm a piece of cheese! # But everyone loves dress up day! # If it's your zing, you can swing like a baboon! Samuel and Rudy are playing, but they can't agree on what to do. Mr Beakman tells them that there must be something they both like. Muffin leads Rudy and Samuel to Missy's house where everyone agrees on dressing up!